Plain and simple: 911 is a three-digit telephone number that you can call 24 hours a day for police, fire or emergency medical services. 911 saves valuable time in an emergency. According to nationwide statistics, it can take up to 2 1/2 minutes to find your telephone directory and another 30 seconds to locate the correct number. In an emergency, 3 minutes is a long time — time that can be saved by remembering to call 911! Call 911 in an emergency when you believe that the immediate response of the police, fire department, or ambulance is needed. Remember that 911 is not for jokes; it is for people that need help. 911 is to be used for reporting emergencies. For general police information, contact your local police department. That non-emergency number should be found in your local telephone book. To call 911 from a home phone or a simple business phone, pick up the phone, and press the numbers: 9-1-1. 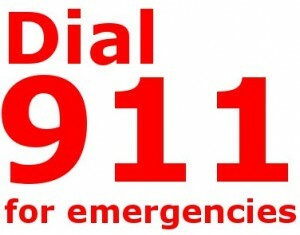 To call 911 from a Centrex or PBX business extension, obtain an outside line, and then press the numbers: 9-1-1. To call 911 from a pay phone, no money is needed. Simply pick up the receiver, and press the numbers: 9-1-1. To call 911 from a cellular or mobile phone, press the numbers: 9-1-1, and then press the “send” button. Be prepared to give your cell phone number and location to the 911 telecommunicator. When you dial 911 from a wireline phone in St Clair County, your call will be automatically routed to the 911 answering point that provides emergency services for the location from which you are calling. When you dial 911 from a cellular phone, the call will be delivered to a PSAP based upon the initial location of the caller. In some cases the answering point that receives the initial 911 call may need to transfer it to a secondary answering point. The caller will be told that they are being transferred and instructed to remain on the line. Do not hang up during the transfer. What kind of emergency do you have? What phone number and address are you calling from? For medical emergencies, you will be asked the patient’s age, what is wrong with them, and whether they are conscious and breathing. Post your address, phone number, and the closest street intersection to your home by each telephone so it is available for anyone who needs to make a 911 call. Make sure that your home is clearly marked with your house number. It should be visible from the street or posted where your driveway intersects with the main road. Talk to your children about how to use 911. Also discuss what is an emergency and what is not.